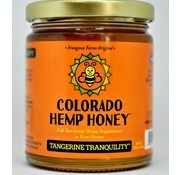 Tangerine Tranquility - calm, sleep, uplifting with 500mg of CBD in the jar. 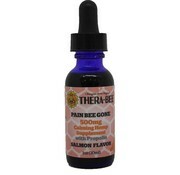 Thera-Bee Pain Bee Gone is full of terpene rich, full spectrum hemp extract. 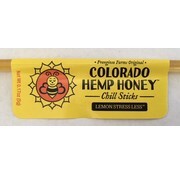 This extract are non-psychoactive, help calm and engage a healthy inflammatory response in your pet, and are 500mg in 30ml bottle. 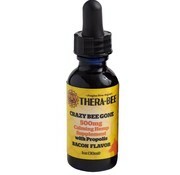 Thera-Bee Crazy Bee Gone is full of terpene rich, full spectrum hemp extract. This extract are non-psychoactive, help calm and engage a healthy inflammatory response in your pet, and are 500mg in 30ml bottle. 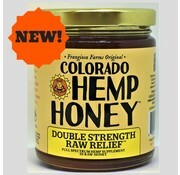 Enjoy our latest creation of pure and raw honey and double the full spectrum hemp extract and naturally occurring CBD in our 6 oz jar of Double Strength Raw Relief. 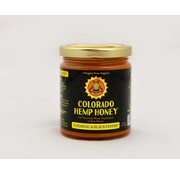 Experience the power of Colorado Hemp Honey combined with the dynamic, anti-inflammatory benefits of the ayurvedic herb turmeric and black pepper. 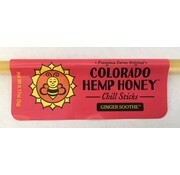 Including 15 mg of Colorado grown full spectrum extract per serving. 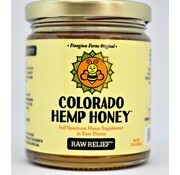 Raw Relief - calm, balance, restore, layered benefits with 500mg of CBD in the jar. 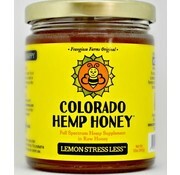 Lemon Stress Less - cleansing, uplifting, calm and sleep, pain with 500mg of CBD in the jar. 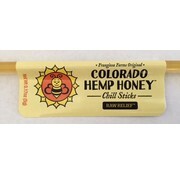 Raw Rocky Mountain honey made of full spectrum hemp and CBD extract.